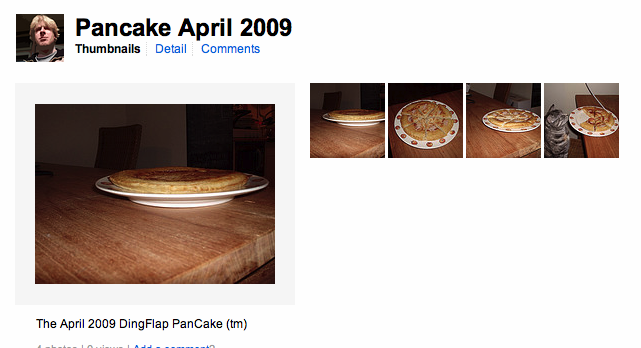 So, I made 1 pancake, and it’s enough for 2 days haha. I got pancake mix, eggs, milk, and made a mix with not enough milk, so the mix is a bit too thick. This is perfect! Now in the meantime the frying pan has slowly been heating up on medium and I just add some butter and set it to lower. I poor the mix in – all at once. And I close the pan with a glass top. Once the top looks ‘dry’ you can flip flap the ding flap and do the other side. At this point one side is done, add a mix of cinnamon and fine sugar. This will add a very nice and yummy layer when it’s all done. Done? Good, put it on a plate – and add a bit more cinnamon and fine sugar on it, and cut the dingflap in multiple pieces. Optional you can now poor a bit of butterscotch syrop, or Amaretto liqueur, or some vanilla icecream before serving.